One of the principal offerings of DCC by Design is customezed JMRI control panels using JMRI PanelPro. We do not sell software, rather we configure the JMRI PanelPro for your layout. These panels can be used to implement automated signals, computer-based dispatching, turnout and route control, or other automation. We recommend the Java Model Railroad Interface (JMRI) suite, which includes Panel Pro. JMRI is a free open-source program developed a group of very computer savvy model railroaders. We like JMRI because of its tremendous flexibility and price. Of course the flexibility of JMRI also means that there are many settings and options that need to be configured and that is where our service adds value. while the sky is the limit as far as ways to configure the panel, typically panel designs fall into one of these four categories. The layout is shown in linearized format & indicates turnout names or numbers. Beneath the track diagram are the plates & switches to control the turnouts. Clicking anywhere on the plate will change the turnout direction. Occupancy is shown by lamps which are yellow to indicate occupancy. Signal control based on occupancy can be added easily; however, dispatcher controlled signals make it visually complex. The Proto US&S panel is suggested when dispatcher controlled signals are desired. The graphics for the panel, lights & plates are provided as part of the JMRI installation. The track plan and code are developed specifically for your layout. This is considered a low price option. The modern panel approach is similar to the Norfolk Southern panel featured on the Trains video "Railroads & Coal" which was filmed around 2000. This panel illuminates the selected route in bright blue. Turnouts are controlled by clicking on the turnout to change the route. Occupied blocks are shown in yellow. No signals are shown on the panel; however, they are set on the layout based on the occupied block and selected route. Dispatcher controlled signals are typically not provided, but can be done. All graphics and code for this panel is custom made from components developed on previously panels. Since there is some reuse, this panel is considered a medium priced option. This picture show a computer based Union Switch and Signal style CTC machine that we built in JMRI. While similar in look to the Basic Panel, the Proto US&S operates very differently. The key difference is that this panel features a fully functional code button. When the switches on the panel are changed for turnouts and signals, nothing happens until the code button is pressed. Then the commands are sent to the DCC system and the lights update as the commands are implemented. This feature makes the panel better suited to more experienced dispatchers. The graphics for the panel, lights & plates are provided as part of the JMRI installation. The track plan and code are developed specifically for your layout. The code feature of this panel makes it a medium priced option. 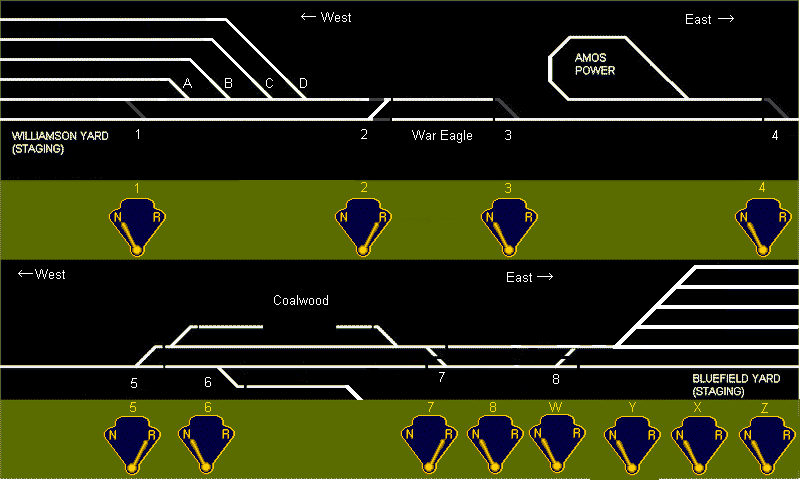 In this style, rather than build a traditional Dispatcher schematic view, such as the US&S Example, we provided a Layout View which generally replicates the track arrangement of the actual layout. This graphic provides turnout control in a layout view. All turnout use green to show their normal (or closed) direction. When switched to the reversed (or thrown) direction, the turnout color changes to red. Block occupancy can be shown in yellow or another color. A second example show a slightly different variation on the same theme. This is for the same layout, so the track arrangement is the same. The route is not show, but the occupancy is shown in red. Turnout control is also provided and shown. In this example the signals are provided so that the dispatcher can verify the routing. This graphic provides turnout control in a simplified layout view. All turnout use green to show their normal (or closed) direction. When switched to the reversed (or thrown) direction, the turnout color changes to red.